Summer's over and the days are slowly starting to cool down. In other words, it's perfect hiking weather. That was the inspiration for September's Great Outdoors box. Again, there was a shipping snafu and September's box didn't find me until well into October, but where I live October is still great for becoming one with nature. 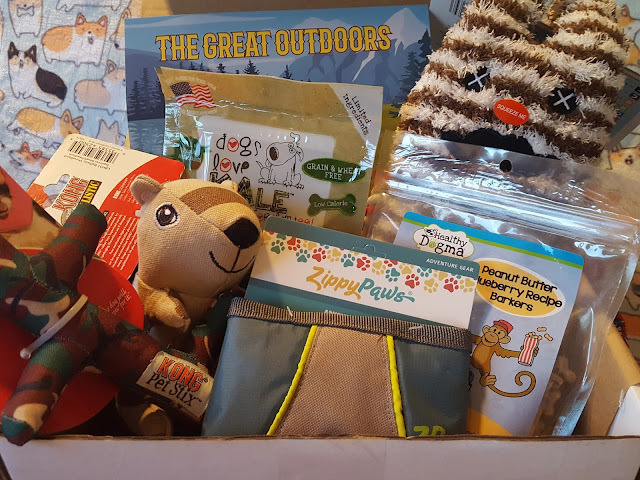 Let's see how Pooch Perks plans to bring the Great Outdoors indoors! 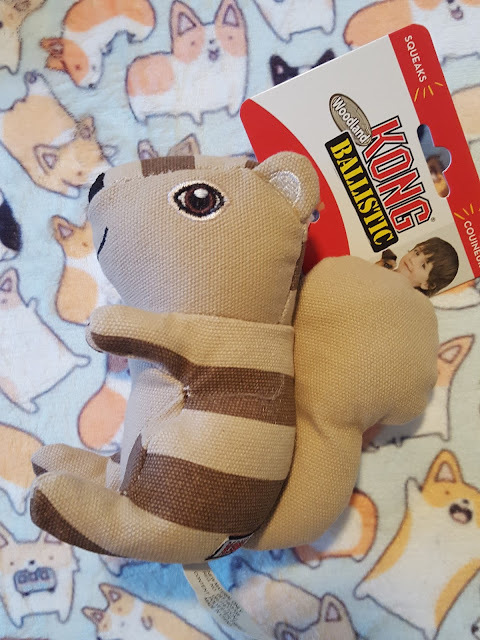 Kong Ballistic Woodland Squirrel - The thing I love about Kong toys is that they can actually stand up to my dogs' chewing tendencies. 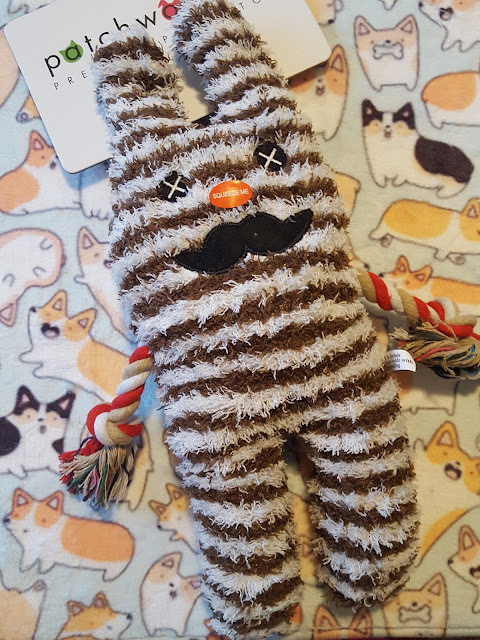 Macho must play tug of war with every single toy he touches and Pebbles has to rip it apart at the seams until she extracts the squeaker. The reinforced canvas material on this squirrel will definitely make it harder for her to grip but she'll get there eventually. And then there will be the stuffing to deal with...oh my gosh, the STUFFING. 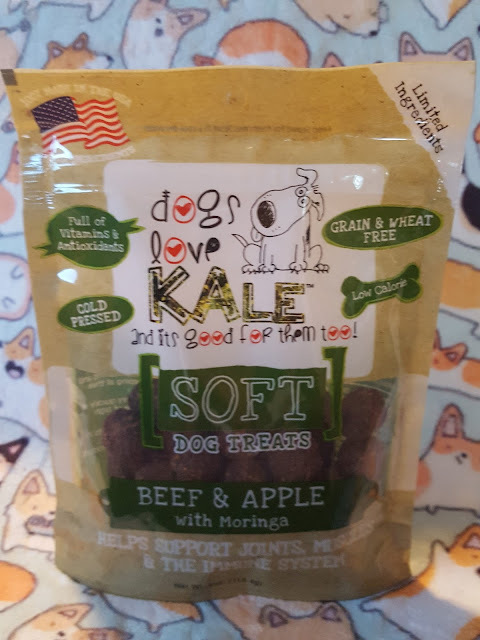 Dogs Love Kale Beef & Apple Soft Dog Treats - They really do love kale. But when you mix it with beef I'm sure they would. 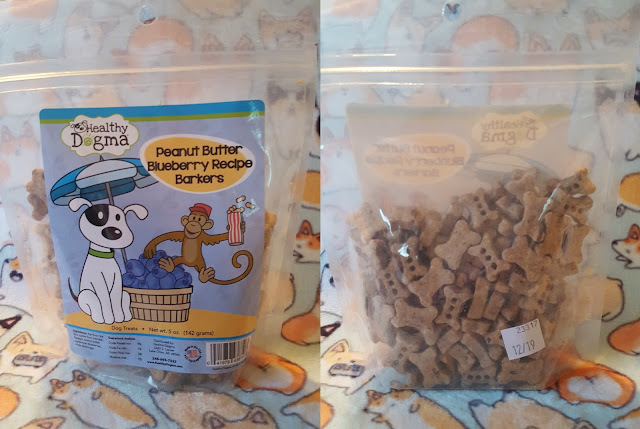 Macho and Pebbles both love treats from this brand (and I love that it's packed with all kinds of good stuff) but I recently discovered that my poor Macho man is allergic to peas which is the second ingredient in here. Sorry bub, you'll have to wait till the next one comes along. Kong Pet Stix - Another toy from Kong! 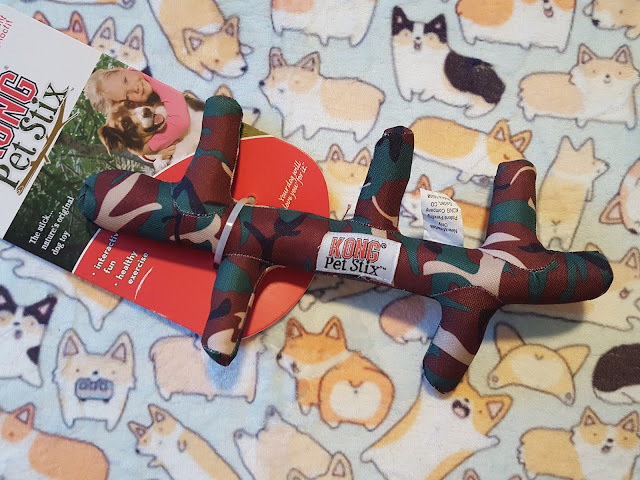 This camo toy will definitely stand up to my little monsters. 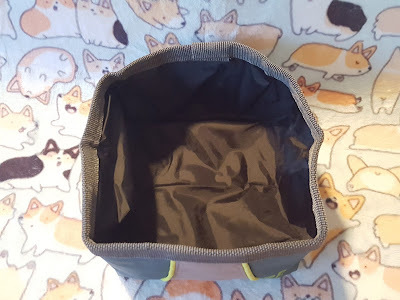 Even though it contains stuffing, it's packed to the max with no loose points in the nylon for Pebbles to grasp at and rip it apart. She and Macho will get tons of fun out of this one. Healthy Dogma Peanut Butter Blueberry Recipe Barkers - Healthy Dogma always has really yummy-sounding dog biscuit flavors. And I love that their recipes are all-natural so I could eat it if I wanted to. If. These are made with peanut butter, applesauce, and blueberries. Mmm mmmm delicious. 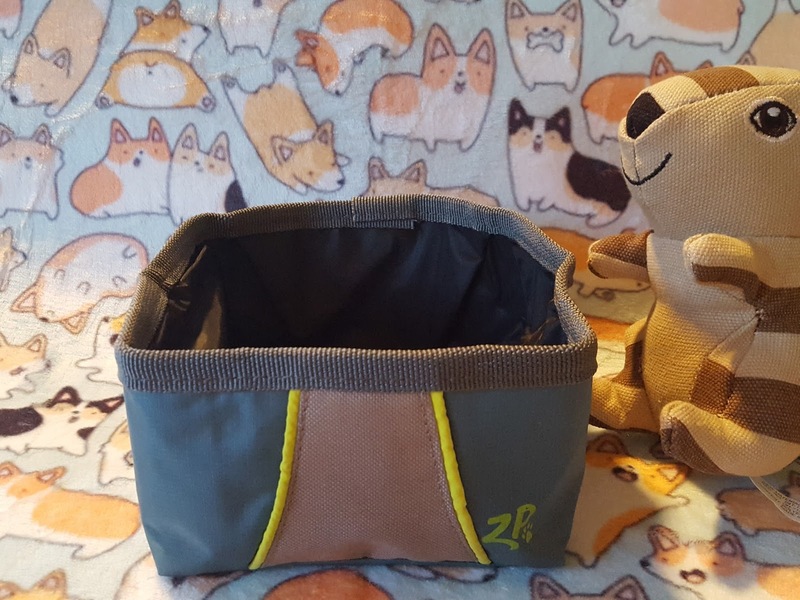 Zippy Paws Adventure Bowl - Perfect for the outdoorsy dog, this portable bowl can hold 3 cups of kibble or 22 oz of water. It even folds flat so you can stuff it in your pocket or jacket if you're trying to pack light. Verdict: As always, Pooch Perks is spot on with the theme. What's even better (and my dogs concur) is that there were THREE toys included in this box, two of them being Kong favorites. I also appreciate that a dog accessory found its way into here. My pups love the treats and toys, but the humans like to see other dog supplies once in a while, too. I'm a little sad that we can't keep both treats, but when you have a dog who's allergic to fillers as common as peas and potatoes you can't really blame anyone. So all in all another great box of goodies!